With a title inspired by the University’s alma mater, A Legacy to Hold, A Future to Build is a beautiful bound “coffee table” book that tells the story of some of the most significant moments in our history. From the blessing of a single block of granite on an August day in 1888 to an incomparable community of faculty, staff and students setting the world on fire, explore the rich history of the University across the decades in words and more than 140 color and black and white photographs. 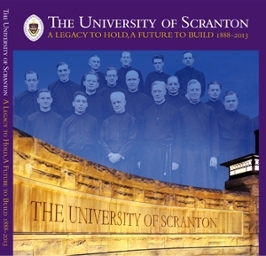 The moving history of The University of Scranton is now available for sale in the University bookstore on campus. It is for you to put your shoulder to the wheel and to see this institution of learning rising up, and it is the great desire of our heart to see your children gather therein to learn first the faith and then to learn those other branches necessary for their welfare in the world.